p.s. I’m only showing screenshots of the African breakdown. You’ll notice it will often not add up to 100%. In most cases this is because of a well known “bug” in the current version of Ancestry Composition causing people of 100% “Sub-Saharan African” (SSA) descent to show trace levels of non-SSA admixture or “unassigned” ancestry, this can generally be considered “noise”, i.e. reflecting an artefact of the DNA test. Hopefully it will be fixed with the next update. In some other cases though the individuals will have genuine additional non-SSA ancestry, which might however be “native” to Africa still if it’s labeled as “North African”, otherwise it might reflect historical geneflow from outside of Africa within the last 500 years or even earlier. 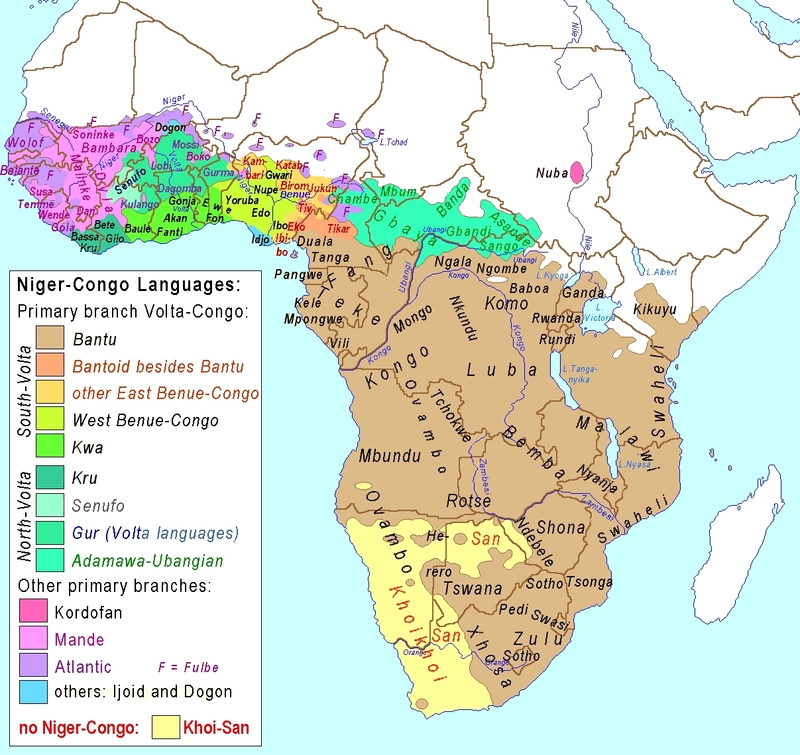 Despite the name this socalled “West African” category is really measuring ancestry from “Niger-Congo” speaking populations, not only from West Africa, but also including Bantu speaking parts of Central, East and Southern Africa. Aside from any genuine shared ancient ancestry within this huge language group this is also the result of 23andme choosing to include Luhya (from Kenya) and Bantu samples for this category. Afro-descendants will therefore be shown as overwhelmingly or even almost exclusively “West African” even when in reality they might have more Central African or Southeast African origins instead. Only a future update by 23andme providing sub-regional resolution within West Africa and separating Central and Southeast African ancestry will resolve this highly unsatisfying and confusing issue. Also Bantu speaking people from Central/Southern African countries will generally score over 90% “West African”. For Bantu speaking East Africans it seems to be a more varied picture (their screenshots can be seen over here). Among the results of actual West Africans i’ve seen personally, the ones from Ghana and Nigeria are showing the highest, nearly 100% “West African” scores. This could however be a side effect caused by the inclusion of several 23andme customers from Ghana & Nigeria into the reference samples used for the category. Similar to the Somali and Ethiopian samples this might have resulted in “overfitting” or a “calculator effect“. Although seemingly designed to be a “fit-all” category the “West African” percentages can still be somewhat useful if you pay close attention to the relative differences with the other African (SSA + North Africa) categories, even if they are showing up only marginally. Some of the results from Upper Guinea i’ve seen and also 1 from possibly northern Nigeria are suggestive of these persons having ethnic backgrounds which are characterized by having partial ancestral connections with populations who originally weren’t “Niger-Congo” speakers. In absence of such non-“West-African” or rather non-“Niger-Congo” markers i suppose it’s reasonably safe to assume you can rule out any substantial ancestry hailing from Sahellian Africa. Even though all Afro-descended results i’ve seen show up as overwhelmingly “West African” for reasons already discussed, the very subtle variation in relative dominance of “West African” percentages as well as the appearance of non-“West African” percentages are most likely indicative of differentiated origins within Africa. A future update with more sub-regional resolution will undoubtedly show this in greater detail. I’ve really only seen sufficient results for African Americans and Cape Verdeans to make any assumptions but it’s striking that especially Jamaicans seem to score the highest “West African” scores relative to total SSA. See also this spreadsheet i made based on results that were shared on the 23andme forum. It might be in line with their documented African origins being mostly from the area in between Ghana and Nigeria, and less varied (proportionally speaking) than those for African Americans. The same goes for Barbados btw, perhaps confirmed by the screenshot below. For Cape Verdeans it’s intriguing how relatively varied their SSA breakdown is being shown (given the limitations of the current Ancestry Compostion). Even though they could arguably be the most narrowly West African descended Afro-Diasporans it seems that really this “West African” category on 23andme is more so geared to capturing ancestry from Lower Guinea than Upper Guinea. The SSA breakdown for Cape Verdeans is not shown as exclusively “West African” but including “broadly Sub-Saharan African”, some detectable “Central & South African” at times (but not consistently) and especially “North African”. I haven’t devoted a separate subpage to the “North African” category because it’s known historically speaking that many Latin Americans could have inherited partial North African ancestry via the Canary islands or converted “Morisco’s” from Iberia. So in that sense it wouldn’t be clarifying their African ethnic origins resulting from the Trans Atlantic Slave Trade. This could also be the case for Cape Verde to some degree however in addition and perhaps with a higher probability “North Africa” might also suggest direct ancestral connections from Northwest Africa, incl. the Fula who can also show significant North African ancestry (see the previous screenshot of Guinea Conakry and this article). I notice you didn't Mention anything about Haplogroups , 23&me Claimed that i was put in a very rare Haplogroup for 23&me customers. L0a which it says is supposed to be common in people from South Africa, and South East Africa Mozambique . I would very much like to get your thoughts on these results. Thank You ,Much appreciated. About your 23andme results, the African regional breakdown is obviously less informative but the total amount of African admixture is more or less in line with Ancestry. On the other hand the European breakdown on 23andme is more reliable than Ancestry’s imo. Some people don’t like the “broadly this or that” designations. But i find it a more honest approach when based on the data nothing more can be said with any degree of accuracy as well as the reality that most neighbouring populations are simply overlapping in genetics because of ancient shared origins, migrations and intermarriage. MY DNA Matches are still growing..Lol and the full blooded 100% African results that you have pulled up for me i havent been able to get in contact with. I definitely noticed a much better accuracy rate with the European and other non african groups. West European and British Always seemed the most likely candidate where as other places not so much. Specially with all the british names/surnames that run in our family.Out off all the dna predictions ive taken being told ridiculous things like over half of my European DNA is Italian or Hungarian has me doing the biggest eye roll. and questioning the legitimacy of the prediction on everything. DnaLand seems to be in the middle, The African seems to line up. The percentage of African seems to vary. It gives me a lower, but not too low score of 77% African with mostly lower niger valley being first #1 mende Akan regions at #2 Senegal valley at #3 and East africa coming in last. I also do realize that the haplogroup in 23andme only shows a lineage in one Maternal family line. But It at leasts helps with the greater lists of possibly more accurate origins. Trying to find all of my origins(Specifically african) is gonna be proven to be a task in itself. Cause i honestly Don’t know what im going to do with all of these origins and Ethnic mixes lol.I am guessing you have heard about 23andme’s African Origins project? It seems very interesting and exciting, I hope this will add to the future of 23andme finally adding countries to their Database Like ancestry. Their African section seems to need some help.All it seems to do is tell you “You’re African” The same way Ancestry tells Asians “You’re East Asian”. 23and me seems to have a much larger Asian Database. But Ancestry African Database looks as if it might be smaller than 23andme,Im not sure if it is though. I guess i dont fully understand how this stuff works yet. Someone please tell me how they got to the info on the very first picture in this post ? You mean the picture showing a result with 99,9% West African right? This is a screenshot i took from a Ghanaian profile i’m sharing with. It’s also shown further below (“Ghana 1”). I read over your article and it’s very informative. I recently received my results from 23andme and still a bit confused. What I’m getting out of the report is where my ancestors may have came from and not a definite place or tribe. Below are my results. Just like Vanessa, 23andme claimed I was in a rare haplogroup L2c2. Thank you Mary! The latest update of 23andme’s Ancestry Composition has been very disappointing sofar. In particular for Afro-Diasporans. I intend to blog about it shortly.